2. Season the inside of the chicken with salt and pepper, then spoon the crème fraîche into the cavity. Plug the end of the chicken with the lemon half. Rub the chicken with some of the oil, season well and then place into a roasting tin, breast up. 3. Roll the potatoes in the remaining oil and then scatter around the chicken. 4. Place the chicken in the oven and roast for an hour and 10 minutes without opening the oven door. 5. Pick the largest stems off the watercress and put the lot into a large bowl filled with cold water. Push the watercress under the water and place the bowl in the fridge. The clean watercress will float to the top while all the dirt will sink to the bottom. 6. Take the chicken out of the oven. Pour the crème fraîche out of the chicken over the potatoes in the tin, then turn the chicken upside down onto a board and leave it to sit for 10 minutes so that all the juices flow back into the breast. It will be done. 7. Meanwhile, place the tin over a medium heat and bring to the boil, stirring the potatoes around the tin so all the lovely sticky bits come off the sides of the tin and make the sauce. Take it off the heat. 8. Lift the watercress out of the bowl and shake off the excess water. 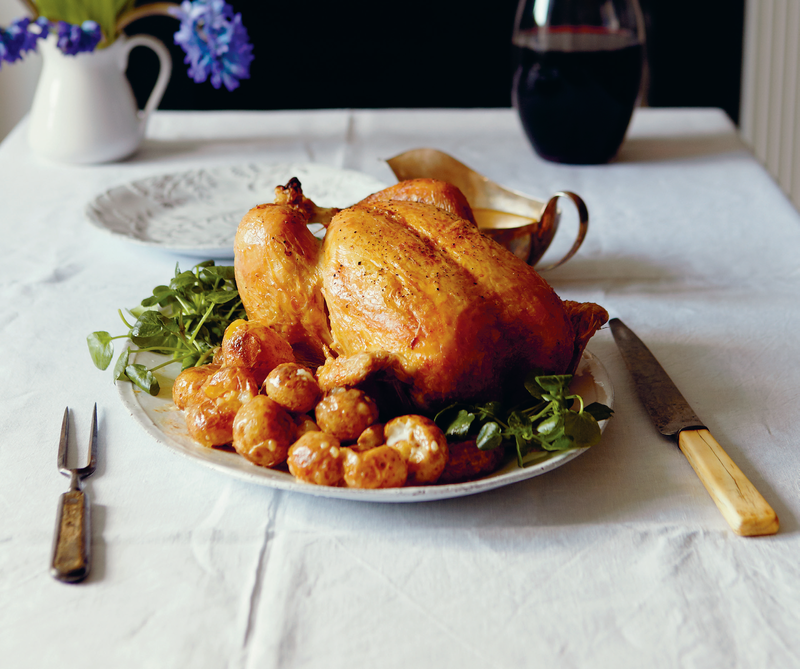 Put the chicken and potatoes onto a large platter, scatter over the watercress and pour yourself a congratulatory vat of wine. Try: Mixing in root vegetables like turnips and parsnips. Also add a spoonful of mustard for a bit of spice in the crème fraîche.